Happy Harold seen here during the re-opening of the East Hill lift. 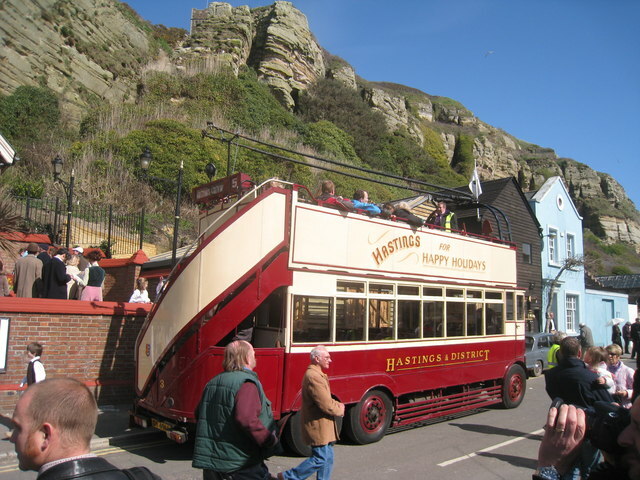 'Happy Harold' is trolley bus which first entered service in Hastings in 1928, when the tram system was replaced. The last trolley bus ran in Hastings in 1959. Happy Harold was restored by the Hastings trolley bus restoration group and is brought out at various events in Hastings. The East Hill lift was re-opened on 27th March 2010, after being closed for almost 3 years. Over 2009-2010 new wooden wheelchair friendly cars were installed replacing the 1970's fibreglass cars. Hundreds of people turned out to watch the Mayor of Hastings cut the ribbon at 11am. A number of people were dressed in Edwardian dress, and some pre-WWII cars were on display, along with 'Happy Harold' an Old Trolley Bus. The lift was open to the public for free for the day, the usual cost would be £2.20 for an adult. A short dead end road at the Eastern side of the Old Town, Rock-a-Nore Road sits at the base of East Hill. To the North side of the road are fish and chips shops, cafés and restaurants. Mid way along is the entrance to the East Hill Lift, Funicular Railway. A new hotel is also under construction. To the South side is the Jerwood Gallery, fishing net huts, fish mongers, a museum in an old chapel, and at the end of the road is an aquarium. Leading off the end of the road is a large car park. This page has been viewed about 565 times. The UK's steepest funicular railway opened in 1902, and was last overhauled in 1970s. For this recent renovation the fibreglass carriages have been replaced with wooden ones, closer resembling the original cars of 1902, but with better wheelchair access.